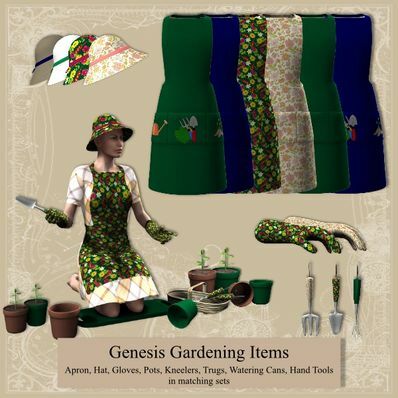 A set of gardening items for Genesis for use in Daz Studio 4. Sets of matching textures for all items plus some plain ones. Items can be resized to fit different characters sizes. This is a wonderful creation, and I will use these often that's for sure. Thank you for this different item. Great work as usual, thank you. Oh, I think my Mother might like a scene I can make with these props. Very nice! What a complete set of gardening tools and outfit, thank you.